In the diagnosis phase, cancer patients are processing the uncertainty around their diagnosis and the possible outcomes in terms of treatment and recovery. All of the information is heavily based on medical terminology the patient may never have heard of before. The diagnosis phase is a period of heightened confusion while the patient begins to learn about their medical diagnosis. The patient will also be sharing their diagnosis with family and friends. This sharing of information with others is an opportunity for the patient to develop a strong support system, however, it could also produce tension in some interpersonal relationships if the family or friend is having difficulty accepting that their loved one is sick. This is most prevalent with children who have a difficult time in accepting the vulnerability of their parent. In the treatment phase, art interventions that focus on body image, identity and self-esteem are the most useful. During this phase patients start to experience the effects of stress over a longer period of time. As patients begin to become more involved with treatment appointments, this takes its toll on everyday life by affecting work and the functioning within a family household. Art therapy exercises that help mitigate this increased level of stress helps provide with the client with an outlet to defuse built up emotions. In the recovery / palliative phase, the patient experiences heightened levels of uncertainty about the effectiveness of treatment, with the possibility that additional treatment is required, or that treatment is no longer helpful. Cancer patients in this stage are at risk of experiencing high levels of anger at the illness. They can also be confronted with an increased level of isolation if relationships are tested by additional difficult news around poor medical treatment outcomes. Art therapy is especially helpful in this process as it helps facilitate ongoing expression and alternative ways to communicate with the cancer patient. Throughout all of the stages, cancer patients benefit from art therapy interventions that help process the nature of the illness. The patient is encouraged to explore painful emotions and physical suffering and be provided with space to fully express their own internal struggles without fear of causing concerns among family and friends. 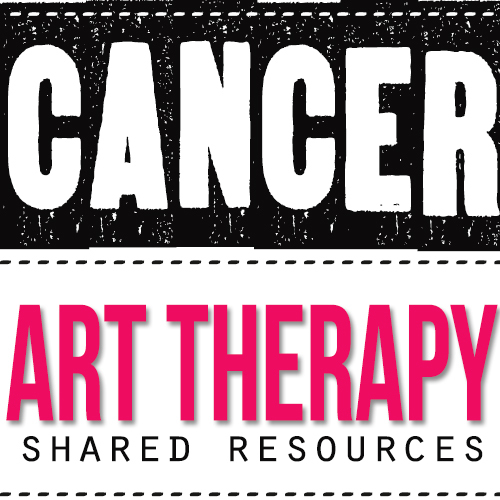 Research evidence that focuses on the use of art therapy with cancer patients is often ad-hoc due to the variety of research design methods in delivery art therapy programs. Despite the lack of a consensus on research methods, the majority of research presents an overwhelming consensus on the positive outcomes of using art therapy with cancer patients. Art therapy can be a humanising experience in an environment that is dominated by medical procedures, terminology and health professionals. This post provides some insight into the common psychological and physical outcomes from using art therapy for cancer patients. A patient’s mood and emotional response is significantly affected by a chronic illness such as cancer. Individual differences is an influencing factor on how the patient will process different stages of the cancer illness. A treatment such as art therapy encourages the individual response that each cancer patient experiences. The artwork created in an art therapy session is an intensely personal reflection of how the patient is affected by cancer. Additionally, the mood and emotional state of patients can also affect the physiological response to the progression of cancer. This is explained by the important relationships between body and mind. Research shows that state of mind can affect the immune system which in turn impacts cancer recovery. In this sense, an indirect relationship between the mind and cancer exists. The invasive medical process of treating cancer can represent a continual process of ‘loss’ to the patient. This can include loss of energy, loss of time, loss of vitality, loss of relationships, loss of enjoying life, and loss of control over future health. Conversely, art therapy can represent a series of ‘gains’ to the patient including gaining self-esteem, gaining self-identity, gaining control over anxiety and attitude towards the illness. Art therapy provides a focus on psychological outcomes of the patient’s experience. Having a forum to explore these themes may result in the patient discovering internal conflicts in decision making around their treatment which may be influencing their acceptance to treatment. 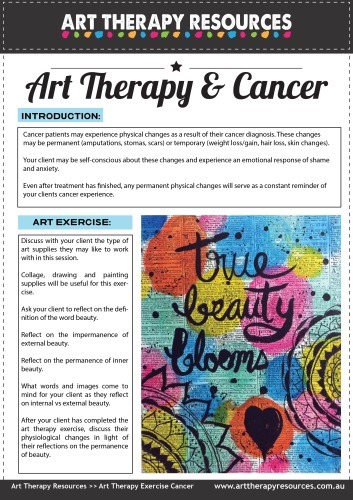 A report in Art Therapy: Journal of the American Art Therapy Association, titled The Demographics and Practices of Art Therapists Working with Cancer Patients in the New York Metropolitan Area, gives insight into the types of materials and techniques that were considered most and least effective in art therapy treatment. This study focused on American Art Therapy Association Members in the New York area (USA) and was conducted in 2003. A total of 386 responses were analysed. It is prudent to take these contributing factors into account, however, it is an interesting study to review against your own experience in your practice. 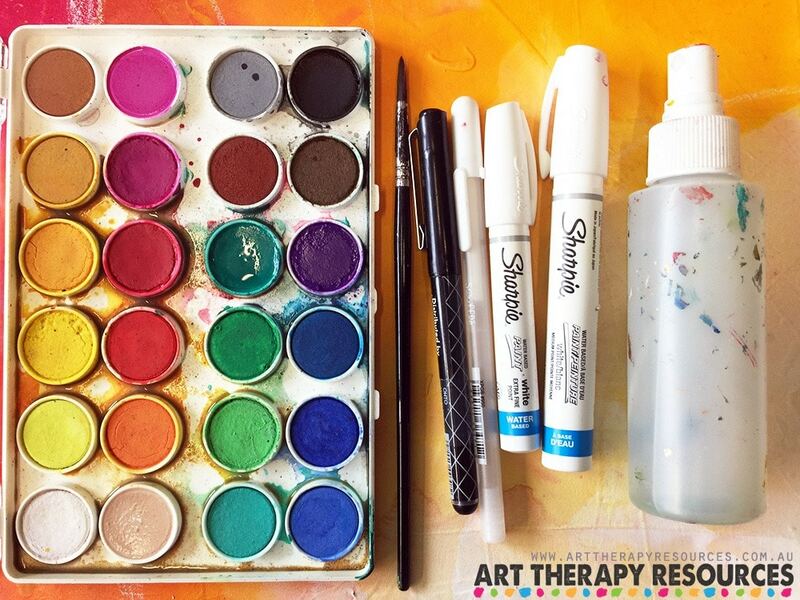 Collage and paint supplies received the highest rate of effectiveness by art therapists which might be related to the ease of use of these materials across a wide range of the lifespan. The article noted that collage, body outline, free choice and writing did not receive any ratings as ineffective. Serious illness, such as cancer, is especially difficult for children who have limited emotional maturity. In addition to the emotional aspect, it can be difficult for children to understand complex medical information and therefore an increased level of uncertainty exists for children. Children experience separation anxiety from their parents and peers when they are in hospital care. Some children may believe the illness is a punishment for bad behaviour before the diagnosis. Teenage children experience an increased level of anxiety over body image and self-esteem. The teenage years signify an intense stage of the development lifespan for all children, however, the stress of physiological changes due to cancer is an additional layer of complexity for adolescents. This concern over body image can affect the acceptance of undergoing medical procedures that may result in physical deformities. Art therapy provides children with a way to communicate their inner fears which may be difficult to communicate verbally to an adult. Art therapy may assist in analysing behavioural problems in children as a response to the invasive experience of medical procedures. Children understand that treatment makes them feel worse initially but often can lack the foresight of how the treatment may positively influence their future recovery over the long term. It is important to remember that cancer patients may have a negative reaction to the smell and feel of some art supplies. 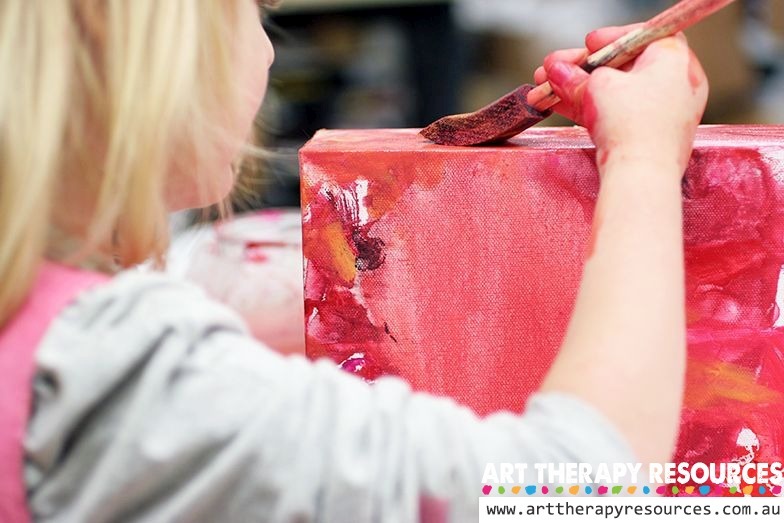 Art therapy activities should take into account any limitations of body movement imposed by medical procedures. For patients who are susceptible to infection, supplies should preferably be brand new or wiped clean with an alcohol solution. The use of online therapy is increasing and this could also extend to delivering art therapy services for cancer patients. This method of delivering art therapy could be especially beneficial for young adults who embrace the use of technology in very aspect of their lives. The use of technology may be familiar to them and therefore break down any possible resistance to seeking access to mental health services such as art therapy. Online therapy may also address issues for cancer patients with weakened immune systems. Online therapy will enable the cancer patient to engage in therapy without being exposed to possible external unsafe environments. Studies using online art therapy found that being able to participate in group activities online gave the participants a sense of connection with others who were sharing the same experience through their cancer diagnosis. For online art therapy to work, the technology should facilitate the sharing process, however also be robust in security. 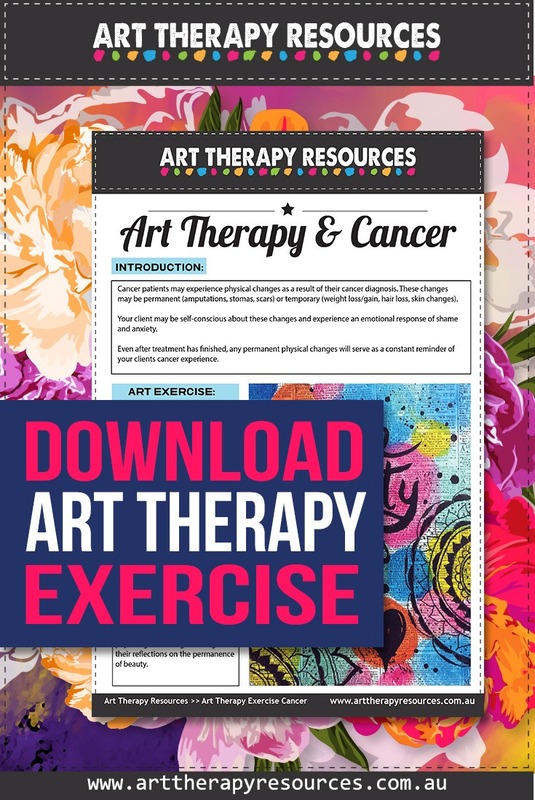 Sign up below to download the FREE Art therapy exercise for cancer patients.